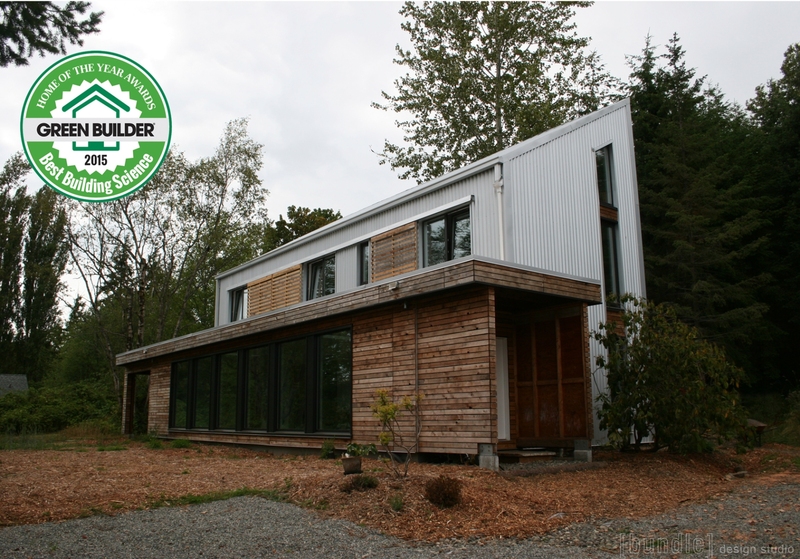 Dan Welch of [bundel] was recently honored for “Best Building Science” by Green Builder Media for his Birch Case Study House. Photo courtesy: Sustainable Connections. It’s not every day that a one-man building design firm wins an international award, but that’s exactly what Dan Welch of [bundle] did this past December. 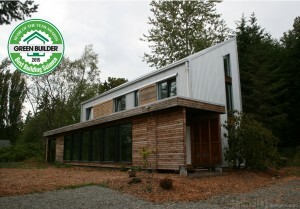 Welch was honored for “Best Building Science” by Green Builder Media for his Birch Case Study House, a state-of-the-art energy efficient home in the Birchwood Neighborhood. The award and his successful building design company are the fruition of a quest based on ideas and goals the father-of-three developed in graduate school that he has pursued tirelessly ever since. Originally from Boise, Idaho, Welch attended Whitworth University in Spokane where he met his wife, Ashley. There he earned a teaching degree and certification in art. The couple was first introduced to the Bellingham area when Ashley transferred to Western Washington University to finish her teaching degree while Welch pursued his Master’s in Architecture from the University of British Columbia (UBC). While there, Welch developed his Master’s thesis not on designing a unique building but on a new business model that would eventually become the blueprint for his own building design firm, [bundle]. That model focused on hyper-local building design and construction and included a case study home in the Birchwood Neighborhood that would eventually become the home that won him the international award. You’d never know that this humble dwelling was the international award-winning Birch Case Study House in the Birchwood Neighborhood. Photo courtesy: Dan Welch. After graduating from UBC, Welch worked for a couple of architectural firms in Vancouver, British Columbia, primarily designing extremely high-end homes. “I worked on one residence that was 26,000 square feet designed for just three people,” notes Welch. “They were other-worldly and not very fun for me.” That experience was almost the opposite of what Welch’s [bundle] is about. “I like to focus my work and pride myself on helping normal people get normal things done. Budget is a fun constraint. It pushes us to be creative,” Welch adds. Welch moved on to a large Mount Vernon architectural firm where he worked for seven years on larger municipal projects before venturing off on his own in 2013 as [bundle]. He and Ashley chose Bellingham as their home because of its proximity to friends in Vancouver and family in the Puget Sound area. Ashley has worked for Bellingham Public Schools for many years and is currently on maternity leave from her position as a fourth-grade teacher at Columbia Elementary, after the birth of their third child, Grace. Over the past decade, Welch broadened his building design experience with work that is now sprinkled throughout Whatcom County. “I have a long history of projects here, including the very complex Bellingham Technical College’s Campus Center that is 70,000 square feet, the fish hatchery downtown, and a number of small jobs all the way down to little tiny bathroom additions.” Welch’s [bundle] projects have officially shifted his work away from larger commercial buildings toward smaller, sustainability-based ventures that have come to define [bundle] as a firm. His projects generally focus on commercial and residential structures under 4,000 square feet, with residences up to the four-plex size. 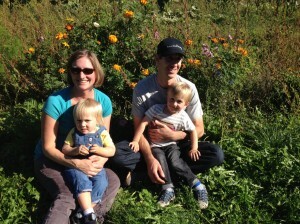 Dan Welch, his wife Ashley, their two sons, and their newborn daughter (not shown) live in the award-winning home. Photo courtesy: Dan Welch. But Welch’s greatest accomplishment thus far may be the award-winning and experimental Birch Case Study House, which the Welch’s now use as their humble abode. The dwelling was developed as a tool to demonstrate the design industry’s most progressive green building techniques. Much has been written about the incredible number of sustainable strategies in this single home built in line with the Living Building Challenge, a certification program that defines and advocates for the most advanced available sustainable design. Welch was inspired to compete for the award after his heroes, Seattle- and Portland-based, Hammer and Hand, won last year with their Karuna Wall Assembly project. Welch loves being absorbed by a project and that has pushed him toward his successes. The Birch house is planned to be net-zero water and net-zero energy, meaning it’s designed with strategies and features that produce as much or more water and energy than consumed. The home is not connected to City of Bellingham water and sewer services, but instead catches rainwater off the roof and treats it with an on-site system. Composting toilets and a gray water on-site treatment and infiltration system ensure safe disposal of wastes. 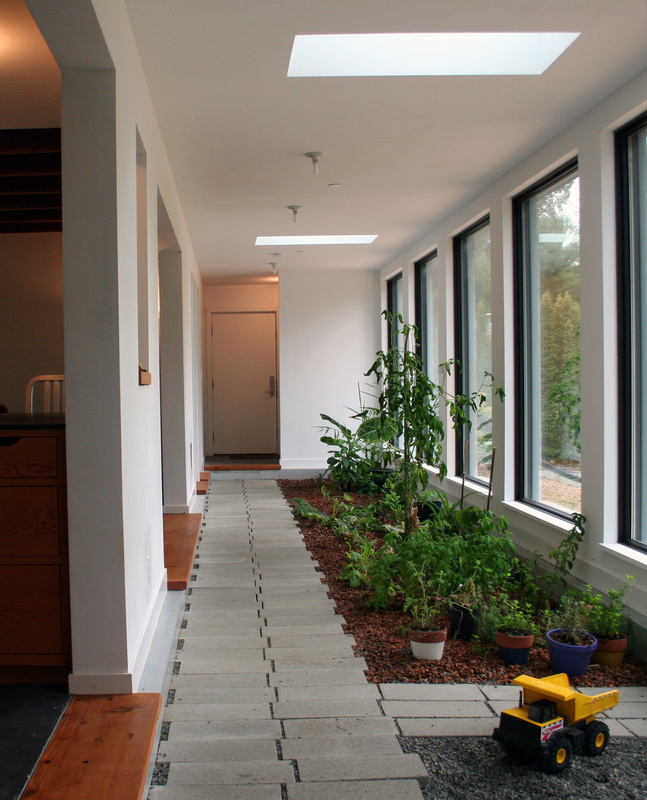 The solarium of the Birch Case Study House is an experiment in bringing gardening to an indoor setting. Photo courtesy: Dan Welch. 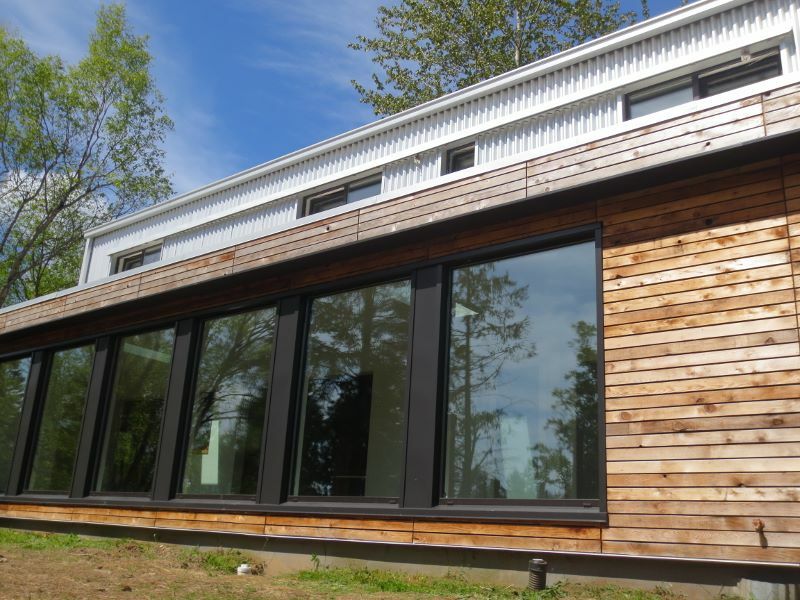 The ultra-energy efficient home also features an air-tight design with continuous exterior insulation, triple pane windows, concrete floors for radiant heat and thermal mass, and a passive solar orientation. In cooperation with Washington State University, Welch arranged for the Birch house to become a field testing site for a new CO2 heat pump not yet available in the U.S. that recovers energy wasted in most homes and channels it to make both domestic hot water and radiant heat. The home was built with as many sustainable materials as financially viable including stairs, beams and floors made from lumber salvaged from the nearby Birchwood Elementary School remodel. Welch partnered with numerous non-profit organizations including Sustainable Connections and the Northwest Energy Efficiency Alliance (NEEA/ Energy Star), as well as a number of manufacturers of sustainable building materials and local businesses. Even the outside of the house was designed with sustainability in mind. 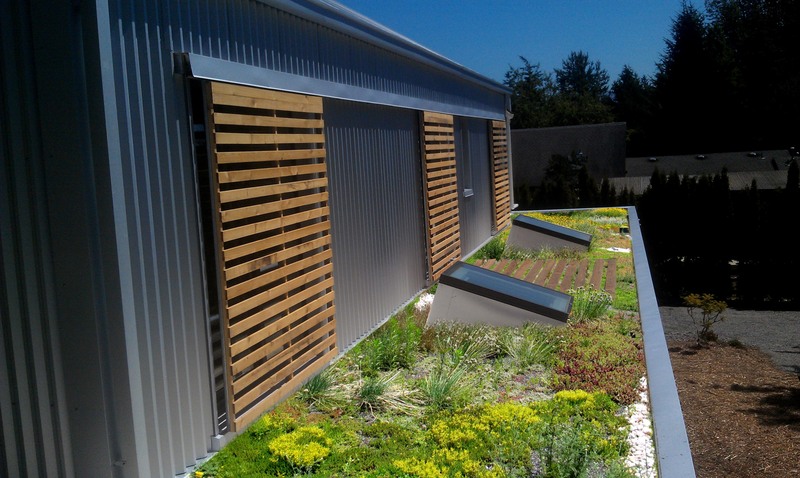 The landscape incorporates significant urban agriculture and management of stormwater through green roofs, rain gardens and a permeable driveway. 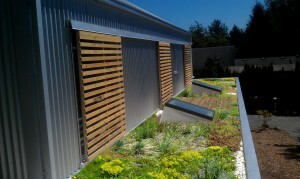 The green roof of the Birch Case Study House adds natural beauty while helping manage stormwater. Photo courtesy: Dan Welch. The future is bright for [bundle]. Welch is working on a number of projects in Whatcom County while he continues to monitor the successes, and failures, of design elements in his own home. The Welch’s also own the lot behind their home and Welch already has another aggressive design planned for a home in that space.